This page contains answers to the most frequently asked questions about our SkySafari Apple iPhone/iPad/iPod Touch apps. I purchased one of your iPhone apps, but I lost my iPhone/iPad/iPod (or I bought a new one). Do I have to buy the app again? No. Just download it again from the app store. Even if you "purchase" it again, you won't be charged. The App Store folks are very careful to make sure you won't pay for the same purchase twice. I purchased your apps, but they won't work on my iPhone/iPad/iPod Touch! Can I get a refund? For SkySafari 5, make sure your device is running iOS 8.0 or later. The app won't work on an older version of iOS. You can update to the latest iPhone OS from Apple, free of charge, using iTunes. It is possible to get a refund for your purchase, but not from us, since the apps are sold through the App Store. Instead, you should contact Apple about this. I purchased SkySafari version 4. Can I get a free upgrade to version 5? Unfortunately not. SkySafari 5 is a significant rewrite of the app; it requires a later iOS version (8), and it's distributed as an entirely separate app on the app store. Apple will not credit the cost of one app toward the purchase of another; this is Apple's policy, not ours. I purchased the basic version of SkySafari 4. Can I get an upgrade to SkySafari Plus or Pro for just the difference in cost? Unfortunately, no. These are separate apps on the iTunes store, and as per above, Apple does not credit the purchase of any app toward the purchase of any other. This is Apple's policy, not ours. Remember - you're actually buying the app from Apple, not from us. It's for this reason that we've kept the Basic version as inexpensive as it is. If you decide that you want to upgrade to Plus or Pro later, make sure you know which one you want. This is a purchase decision which we cannot make for you, and which we cannot reverse. I bought your Android version and/or your Mac version. Can I get a discount on your iOS version? No. SkySafari for Android is a complete rewrite of app, written in a different programming language, running on a device with a different kind of processor, under a separate operating system with a different user interface. Our Mac and iOS apps are sold through different app stores. There's just no way we can offer a common license for all of them. We hope that this won't dissuade you from purchasing the iOS version separately. Most desktop astronomy programs competing at SkySafari's level of sophistication cost hundreds of dollars - ours is priced at the cost of a pizza. At these very low prices, we hope that SkySafari for iOS will provide you with tremendous value, in spite of being a separate purchase. I have a BlackBerry/Windows Mobile/WebOS/other mobile device. Do you have a version of your apps for my device? We currently only support iOS, Android and Mac. If/when we release versions of our applications for other mobile devices, we will announce them very publicly on our web site! Yes! SkySafari is a "universal" app which supports the iPad screen at full resolution, as well as the smaller iPhone/iPod Touch screens. It works almost identically on both devices. In a few places, the user interface has been rearranged to fit the larger iPad screen, but the app's features and functionality remain unchanged. I'm running your app, but all I see is stars! How do I get to the Settings and other controls? Rotate the iPhone to "portrait" mode - the toolbar and other controls will appear. We designed the app this way so the star chart can be shown in full-screen when the iPhone is held in "landscape" mode. If you don't like this, go to the app's Settings > Appearance screen, and turn on the Toolbar in Landscape switch (under the Auto-Rotation section). All that pinching to zoom in and out is making my fingers tired! Is there a better way to zoom in on all those tiny little objects? Yes! The app has "hot corners" for zooming in the lower left and right corners of the screen. These are shown by + and - symbols whenever you swipe or pinch the star chart. Touch + to increase magnification; touch - to decrease it. The zooming will continue as long as you leave your finger down in the desired "hot corner". The compass is not working! How do I make your apps show me the sky as I move the phone around? First, make sure you have an iPhone or iPad with a compass. The original iPhone, iPhone 3G, and iPod Touch all lack a compass, so you won't be able to do this. At most, you'll be able to see the stars move "up and down" as you tilt the phone vertically. If you know where north is on the horizon, you can swipe the screen horizontally to "dial-in" the correct view. If you do have an iPhone or iPad with a compass, tap the Compass button on the toolbar to activate it. If your device does not have a compass, this button will be hidden. Finally, a word of caution: the solid-state compass built into the iPhone/iPad is notoriously inaccurate, and easily affected by interference. It was designed for street navigation, not astronomy, and it can easily be wrong by ten degrees or more. The compass may be useful for locating bright objects in a general part of the sky, but it's certainly not accurate enough to point a telescope. I haven't used your app in a while. Now, when it starts up, I only see an empty black (or green) screen. What's broken? How do I fix it? The last time you used the app, you were probably zoomed in on a very small field of view, and the thing you were looking at is no longer there. (Were you looking at Jupiter's moons?) Try zooming out by placing your finger on the - sign in the lower left-hand corner of the screen. If the entire field of view is green, you are probably looking below the horizon. If the compass is turned on, then you'll always be looking below the horizon if you're looking down at the phone (see the question above). Turn off this setting, or hold the phone above your head. Zooming out should make this clearer. You can also try making the horizon translucent to view the stars underneath it; go to Settings > Sky & Horizon to do this. Your app used to work fine, but now it crashes every time it starts up. How do I fix this? Did you recently update the operating system software on your iPhone/iPad/iPod Touch? Sometimes, iDevices just act strangely. Try rebooting the phone. If all else fails, completely delete the app from your device, and reinstall it from the iTunes Store. You won't be charged for purchasing the app a second time, as long as you purchase it from the same iTunes account that you used to purchase it originally. I'm searching for Comet X or Asteroid Y, but it's not in your database. How can I find it? Recently-discovered comets and asteroids may not be present in SkySafari's original database. To add them, go to the app's Settings > Solar System view, then tap the Update Orbit Data button at the bottom. This will import the latest asteroid/comet data from the Minor Planet Center. If you still can't find your asteroid or comet, the MPC may not yet have added it to its export files. Try again in a few days. Please note: this feature is only present in SkySafari Plus and Pro. It is not available in the basic version of SkySafari. I'm trying to observe a satellite, or the International Space Station. But SkySafari's predictions for where the satellite is/when it passes overhead are wildly wrong. What's the problem? Your satellite orbital elements are probably out of date. To update them, go to the app's Settings > Solar System view, then tap the Update Orbit Data button at the bottom. This will import the latest satellite data from the CelesTrak. Satellite orbits change rapidly due to atmospheric drag, and due to perturbations from the Earth's non-spherical gravity field, so it's important to update your orbit data frequently - at least once a week - to get accurate predictions for them. You also might want to make sure that your location, time zone, date/time, etc. are correct - if you've accidentally set your observing location to California, but you're really in Colorado, that will make a big difference! SkySafari is predicting a rise/set time for the Sun/Moon/some other object which is clearly wrong. Is your app broken? No - this is really basic celestial mechanics that has been tested many times over by our users. The problem is almost certainly that your location, time zone, or the date/time are set incorrectly. Go to SkySafari's Settings view to adjust them. If your device's Location Services are turned off, SkySafari may be unable to determine your current location. A common symptom of this problem is that your latitude, longitude, and time zone will all be zero. To correct this, go into your iPhone's Settings > General > Location Services screen; make sure Location Services are turned ON, and also turned ON for SkySafari. If rise/set times are off by exactly one hour, the problem is almost certainly that your time zone is incorrect, or that SkySafari thinks daylight savings time is in effect when it really isn't (or vice versa). Governments frequently change the rules for Daylight Savings Time, and while we try to keep up with them, we may have missed something. You can manually set your time zone, and turn SkySafari's automatic daylight savings time correction ON or OFF, in SkySafari's Settings > Date & Time view. I want to put "Telrad Circles" on my sky chart, which simulate the field of view of my telescope/telrad/finder/binoculars to assist in star-hopping. How do I do this? Go to the main Settings icon > Telescope Display section, and turn on the Telrad Circles option. If you're connected to a telescope, the Telrad circles will appear on the sky chart where your telescope is pointing. If you're not connected, turn on the Show Even if Not Connected to Telescope option. Then the Telrad circles will always appear centered in the middle of your sky chart. I have a bluetooth serial adapter. Can your iPhone apps use bluetooth to control my telescope? Unfortunately, no. The iPhone OS does not allow third-party applications to have unrestricted access to the bluetooth capabilities built into the iPhone and iPod Touch. That is what we would need in order to make this work, and not having it is a major reason we developed SkyFi in the first place. Unrestricted bluetooth access may be possible with a jailbroken phone. But as licensed Apple developers we can't support that, so currently our apps do not use bluetooth at all. If unrestricted bluetooth access is allowed in future versions of the iPhone OS, this may change. How about the serial pins in the iPhone/iPod dock connector? Can I make a cable to control my telescope with a wired connection from my iPhone? You can make such a cable, but it won't do you much good. As with bluetooth, you'd have to jailbreak your phone in order to use it. As licensed Apple developers we can't support that. A much better idea is to purchase SkyWire - the world's first Apple-approved serial cable for the iPhone, iPad, and iPod Touch. It adds a fully-functional RS-232 port to your iOS device, and integrates seamlessly with our SkySafari app. Since it complies with all of Apple's "Made for iPod" accessory requirements, you don't have to jailbreak your phone in order to use it. I'm using your iPhone app to control my telescope. But the directional arrows don't work - I get an error message that says "Use the telescope's hand controller". What's up? Some telescopes (for example, the Celestron Ultima 2000 and original NexStar 5/8; and the Argo Navis) lack external commands for directional motion. Even though they are mechanically capable of doing so, their control language has no command to (for example) "move north" or "move south". When these telescopes' manufacturers add those commands, we will be happy to support them! Can SkySafari align my telescope for me? Can it use the iPhone's GPS to tell me where the scope is pointing? No. GPS can tell you very accurately where on Planet Earth you and your telescope are located. But it can't "auto-magically" tell you what direction your scope happens to be looking toward. Similarly, your iPhone has no way of knowing the orientation that you may have chosen when you plopped your telescope mount down on the ground. Our app has to rely on the coordinates reported by the telescope mount controller. And for those coordinates to be meaningful, you need to star-align your telescope mount before connecting to it with SkySafari. Every telescope mount has a different star-alignment procedure, so for details consult your telescope manual. But the basic idea is this: manually point your telescope at one known bright star, then tell the telescope mount controller that you are aligned on that star. Repeat the process with a second known bright star. Now the mount can compute its orientation relative to the celestial coordinate system, and the mount controller can tell SkySafari exactly where the telescope is pointing, to a very high level of accuracy. The more carefully you've aligned your scope, the more accurate your GoTos will be. Admittedly, star alignment is one of the trickiest problems encountered by new telescope users. SkySafari can help you with this, by using your iPhone's compass and altimeter to help you find bright alignment stars in the sky. You'll still have to point your telescope at them, following the alignment procedure specific to your particular telescope controller. In the end, though, there's no subsitute for knowing your way around the sky - and for knowing how to use your telescope equipment properly. SkySafari can help you with the former, but is not a replacement for the latter - at least not yet! Observing lists are cool, but creating them by hand is tedious. Can SkySafari import an observing list that I create as a text file, or an observing list from another program? SkySafari does not support other programs' observing list formats directly. But in SkySafari version 3.0.3, we've added code to import observing lists as text files. At least a few other programs (AstroPlanner, Deep-Sky Planner, Eye & Telescope) can now export observing lists to SkySafari in this format. See the the section on Observing Lists in SkySafari's built-in Help file for instructions on how to import them into the program. Briefly: you can use iTunes file sharing to get them into or out of the program. You can also email observing lists to yourself, and open the .skylist file attachment from your iPhone. Or you can use the Safari browser on your iPhone to download and open them directly from web sites like our Yahoo! support group. Comment=Great red spot was great! And red! Lines may be separated by a single linefeed (LF) character ('\n', ASCII hex code 0x0A, decimal value 10), or by carriage return (CR) characters ('\r', ASCII code 0x0D, decimal 13), or by CR-LF pairs. In other words, your text file may be a unix-style text file, or a classic Mac or DOS/Windows text file. Observing list entries are groups of keyword=value pairs. Groups are demarcated by BeginObject and EndObject lines. In the sample above, we've indented the keyword/value pairs within each object for clarity, but you don't have to. SkySafari strips out leading whitespace when importing the file. SkySafari will try to find the object based on the CatalogNumber or CommonName values, and fix up the ObjectID values internally after it imports the list. The CatalogNumber values are used preferentially instead of the name(s). Please use the same catalog abbreviations that SkySafari uses, e.g. Alpha CMa, HR 7001, M 97, NGC 1695. If the object has no CatalogNumber (like Jupiter), then enter its name(s) in the CommonName field. For asteroids, the asteroid number is the CatalogNumber; use the CommonName field for all other solar system object identifiers. An object must contain all of the CatalogNumbers and CommonNames you've specified to import properly. This is how SkySafari resolves ambiguities between diffiferent objects with the same name: for example, comet Garradd (C/2009 P1) vs. comet Garradd (C/2008 J5), or the asteroid Europa (number 52) vs. Europa (Jupiter's moon, no number). In most cases, though, only a single CatalogNumber or CommonName should be required to uniquely identify the object. DateObserved and Comment are optional. DateObserved is the julian date on which your observation took place; Comment is the notes you want associated with the object. Newlines in the notes should be indicated with a \n sequence. How do I get my own horizon panorama into SkySafari? Can you show me an example? See the Help file included with the program, under the Settings > Horizon & Sky section. Briefly: first use a program like Photoshop to create a panorama from individual pictures. Your finished horizon panorama must be a 2048 x 1024 pixel image in PNG format, with alpha (transparency) indicating clear sky vs. opaque ground. North is at the left edge; south is in the middle. Connect your iPhone/iPad/iPod Touch device to a computer with a USB cable, then use iTunes file sharing to copy your panorama PNG file onto your device. 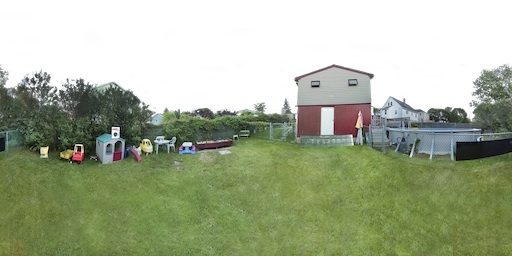 Click the preview image above to view and download the full-sized PNG of Roger's Back Yard. Joshua Bury, creator of the Observer Pro iOS app, has created a web-based application that converts a numerical horizon representation (altitude/azimuth points saved as an Observer Pro .hzn file) into to a panorama that can be used in SkySafari. 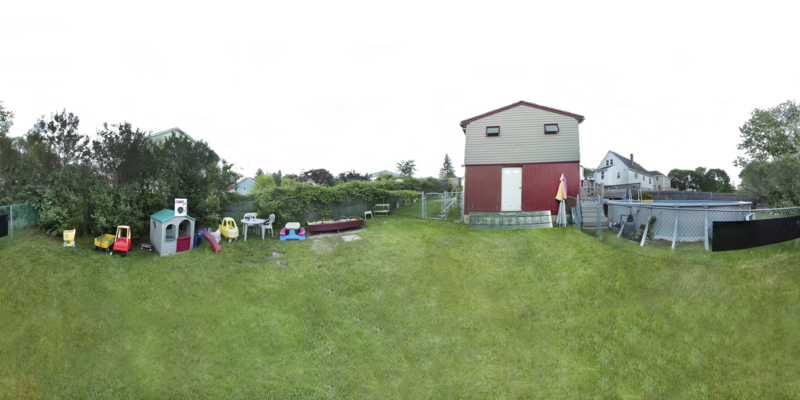 It's not as accurate as a well-done photographic panorama, but it is really easy to create, especially if you've used Observer Pro to measure your horizon. The horizon is not visible! But I've got "show horizon and sky" checked, and/or a panorama selected, in my Horizon & Sky Settings. What's wrong? If you're running SkySafari Plus or Pro, make sure your coordinate system is set to Horizon coordinates. Look in your Coordinates settings. If set to Equatorial, Ecliptic, or Galactic coordinates, the horizon will not be shown. This is deliberate - these other coordinate systems do not align to your local horizon, so it would appear skewed at a weird angle. A printed star chart uses equatorial coordinates, and does not show the horizon either. SkySafari is no different. The sky chart is covered with hundreds of labels for satellites/comets/asteroids, and I can't get rid of them! Is that a bug? No, you have just turned on highlighting for an object list. Look for a small green list icon at the bottom of the sky chart, and tap it. That will bring you to the object list that is highlighted. Switch off the highlighting, and the labels will go away. This feature is intended to let you quickly see where all objects in a particular list - for example, Messier objects, or an observing list that you've created - are located in the sky. You might have highlighted that list by accident. The green list icon always brings you back to the list that is highlighted. Can SkySafari compute the exact angular separation between two objects in the sky? 1. Tap the first object to select it, then double tap the second object. This turns on measurement mode. A blue line is drawn from one object to he next with the angular separation. Tapping and dragging on the second object will allow you to move the end point to another object. To exit measurement mode just tap anywhere else in the chart. 2. Select the first object by tapping on it or searching for it. Then select the second object (also by tapping or searching). Finally, tap the Info button on the main toolbar. The Object Info data table shows the angular separation from the 1st object to the 2nd object, and the position angle. It also shows the 2nd object's angular separation and position angle from the Sun, and from the chart center. I've turned on Night Vision, but part of your user interface is still drawn in white. Can you fix that? Possibly not. Making every iPhone user interface element red is actually very challenging; there are some things that iOS does not give us any control over. For this reason, we always recommend using a sheet of red cellophane, like Rubylith, if you absolutely need every part of the screen to be red. And a "hardware solution" like this will work even if our app is in the background. Some double stars don't show their companion when I zoom in. Why is that? The only stars we plot on the chart are the ones in SKY2000, Hipparcos, and Tycho 2 catalogs (and GSC2, in the Pro version). If your star isn't in those catalogs, it won't be displayed. The only exception to the above are stars whose primary is in the above catalogs which also happen to have orbits in the 6th Binary Star Orbit catalog. If that star has an orbit, and its companion isn't already obviously listed as a separate entry in SKY2000/HIP/TYC2, then we generate a separate binary companion for it.